Why remake the weepy women’s movie “Beaches” (Lifetime, 8 p.m.)? 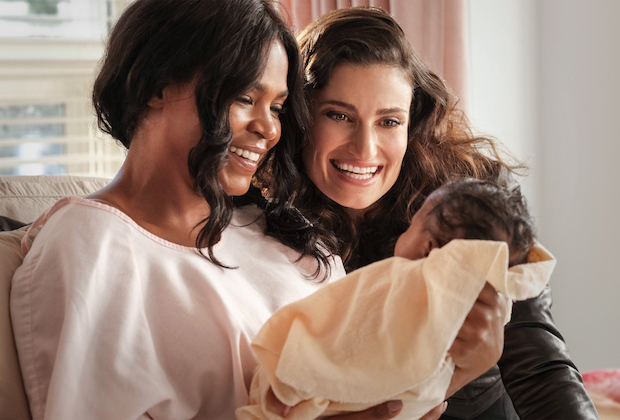 Maybe just so Idina Menzel who costars with Nia Long, gets to sing “Wind Beneath My Wings” more than once. The music and its signature song were a draw to Menzel. Not sure whether it warrant “Beaches: The After Party” (Lifetime, 10 p.m.), hosted by Sara Haines. U.S. Figure Skating Championships (NBC, 8 p.m.) with women’s free skate goes prime time. The pairs an dance finals are on at 3 p.m.
Melissa McCarthy’s “The Boss” (HBO, 8 p.m.) makes its premium cable debut. Also on cable tonight is the horror sequel, “The Conjuring 2” (Cinemax, 10 p.m.) and “Secret in Their Eyes” (Showtime, 8:30 p.m.) with Julia Roberts and Nicole Kidman. The team has to negotiate with bank robbers on “Ransom” (CBS, 8 p.m.). Do we still care “Is O.J. Innocent? The Missing Evidence” (TLC, 8 p.m.). Other NBA action includes the D-League showcase of Maine vs. Fort Wayne (NBA, 12:30 p.m.) and Iowa vs. Rio Grande Valley (NBA, 3 p.m.). Ryan Gosling, Emma Stone, Ben Affleck, Sienna Miller and Gregory Porter join “The Graham Norton Show” (BBC America, 10 p.m.). Leading man Dana Andrews is featured on Turner Classic Movies with “Boomerang” (8 p.m.), “Fallen Angel” (9:45 p.m.), “While the City Sleeps” (11:30 p.m.) and “Beyond a Reasonable Doubt” (1:15 a.m.). Then come a couple of horror movies, “The Hidden” (2:45 a.m.) and “The Terminal Man” (4:30 a.m.). A whole lot of men’s college basketball today includes Providence at Villanova (Fox, noon), Vanderbilt at Florida (CBS, noon), Syracuse at Notre Dame (ESPN, noon), Georgia at Texas A&M (ESPN2, noon), Nebraska at Rutgers (ESPNU, noon), Fordham at Massachusetts (NBC Sports, 12:30 p.m.), Tulsa at South Florida (ESPNews, 1 p.m.), Navy at Army (CBS Sports, 1:30 p.m.), Texas at Kansas (CBS, 2 p.m.), Oklahoma State at Texas Tech (ESPNU, 2 p.m.), Iowa State at Oklahoma (ESPN2, 2 p.m.), Butler at DePaul (Fox Sports 1, 2 p.m.), Louisville at Florida State (ESPN, 2 p.m.), Marquette at Creighton (Fox, 2:30 p.m.), Rhode Island at Duquesne (NBC Sports, 2:30 p.m.), Michigan State at Indiana (ESPN, 4 p.m.), Arizona at UCLA (CBS, 4 p.m.), Cincinnati at Tulane (CBS Sports, 4 p.m.), Alabama at Auburn (ESPN2, 4 p.m.), South Carolina at Kentucky (ESPN, 6 p.m.), Fresno State at Nevada (CBS Sports, 6 p.m.), Houston at SMU (ESPNU, 6 p.m.), West Virginia at Kansas State (ESPN2, 6 p.m.), Wyoming at New Mexico (CBS Sports, 8 p.m.), Baylor at TCU (ESPNU, 8 p.m.), Miami at Duke (ESPN, 8:15 p.m.) and Long Beach State at Cal Poly (ESPNU, 10 p.m.). In women’s games it’s Navy at Army (CBS Sports, 11 a.m.). The Australian Open (ESPN2, 9 p.m.) moves to the round of 16. Margo Price and Hayes Carll play a new “Austin City Limits” (PBS, 11 p.m., check local listings). Aziz Ansar hosts a new “Saturday Night Live” (NBC, 11:30 p.m.) with Big Sean as musical guest.